Shark Diving Xperts is dedicated to giving scuba diving enthusiasts, non divers, film makers and shark lovers from across the globe the ultimate great white shark cage diving experience, right here in Guadalupe! Enjoy unbeatable diving conditions with the world's biggest white sharks - no experience required! Live aboard our luxury dive vessel, enjoying some of the best cuisine between incredible dives. An experienced crew who love sharks, diving and have been featured on a variety of documentaries! Our great white shark diving trips are all inclusive. There are no hidden extras to worry about. What makes our trips different from many others is that although our 90 ft vessel is capable of holding up to 30 passengers we limit our shark trips to just 16. This is the lightest passenger load you will find on any shark trip available at Guadalupe island. Another benefit to the lower numbers is that it makes the trip more personal. From past experience, we know that the best kind of trip is when everyone becomes “part of the crew” for the 5 days at sea. Our crew to passenger ratio is 1:2 so you and everybody else on board will get a very personal and professional service, allowing us to cater for your particular needs whatever they may be. World-renowned Great White shark location, famous for its “mega” sized sharks. Home to an abundance of marine life. Sharks are not the only wildlife you will be encountering! 220 miles South West of San Diego and approx. 165 miles off the west coast of Ensenada. Dramatic, majestic and untouched. A truly unique and breathtaking location. Welcome to Guadalupe Island! 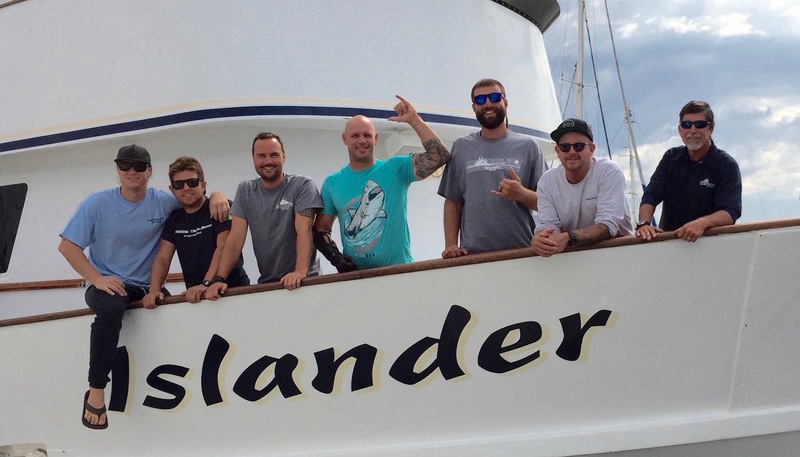 Our vessel, a custom built 90 ft.live aboard is your home for GW shark expeditions. 2 huge surface cages holding up to 4 people each with plenty of room for equipment. Cage diving at its best and most comfortable. 2 additional cages available for film crews and private charters giving unique perspectives for professional photographers as well as exhilarating and unforgettable expereinces. Spacious dive and viewing decks for you to enjoy the action even when you are not in the water. Flexible and compatible for film production. With our crews experience and skill set we can work with you to get whatever shots you need. 11 luxurious state rooms designed for maximum comfort. 2 beds, air conditioning, electrical outlets, wash basin and plenty of storage. Want a state room all to yourself? No problem, private state rooms available on request. Huge galley with plenty of space for you to relax between dives, socialize and enjoy our chefs amazing food! Openly designed outer decks and rooftop. Enjoy some Mexican sun and relax between dives. Everything. Once you board our vessel there are no hidden fees for the rest of the 5-day trip. We supply all the food you can eat, all Mexican visa fees, Guadalupe Island permits, all accommodation, all beer and wine, all equipment including wetsuits and masks plus sharks and memories to last a lifetime. It is customary to leave a gratuity for crew which is typically between 10-20% of the scheduled trip fare. Yes, cage diving with great white sharks is one of the safest shark dives you can do. As well as quoting our 100% safety record we must point out that contrary to popular belief, the sharks are often cautious and timid during dive operations. The animals often approach our cages with extreme care and will vary rarely bump or mouth the cages for investigation. On rare occasions, if this does happen our cages are designed to withstand the challenge. The sharks are not being aggressive, just exploring new objects in their environment. Never forget, our highly qualified and experienced crew always regard your safety as their number one priority and will never put you in a situation that is deemed to be unsafe in anyway. How does Guadalupe Island compare with other GW shark locations? We believe that Guadalupe Island is hands down the best location in the world to dive with great white sharks for a number of reasons. Firstly the water clarity is unlike any other location (up to 100ft vis) and is often calm and warm making the diving very pleasurable. Secondly, the average size of the sharks found at Guadalupe is huge unlike many other locations (between 12-18ft). Lastly we believe that if you want to meet a great white shark it is something that you have wanted to do for a very long time so why not do it well? Due to our time at sea and the abundance of sharks found here we feel after the end of the 5 days you will have had the “ultimate great white shark experience” at Guadalupe. Do I need to be SCUBA certified to cage dive? No, we will give anyone who is non-certified a quick and easy lesson on the basics of scuba diving en route. Often, many people on our trips have never dived before and after this quick scuba class are soon in the water enjoying the sharks like pros. How much dive time can I expect during the trip? Underwater time for our guests average between 12 – 18 hours over the course of 3 days. This is due to our cage capacity and our limited amount of guests. Unlike some great white shark operators who only offer 45 mins in total, on our trips, by the 3rd day we often see divers sitting out rotations out of choice as they have simply seen so much. How big are the great white sharks? Male white sharks average between 10-14ft and the females between 12-18ft. It is theorized that the sharks visit the Island to breed so most of the sharks we see are mature animals. What is special about the great white sharks at Guadalupe Island is not only their size but also their girth. These animals are wide! You will truly appreciate this when one is cruising towards you. How reliable are the great white shark sightings at Guadalupe Island? We have never failed to see sharks on any of our trips such is the high concentration at Guadalupe Island. It is not uncommon to have more than one shark around the cages at the same time and on spectacular days, lucky guests can be treated to the sight of between 5 – 7 different sharks circling the boat! Simply put, it is an embarrassing amount of great white sharks and by the end of the trip will have certainly got your fill of sharks. We are diving in the Pacific Ocean and clarity is often between 80 – 100 ft. It is not a case of peering into the gloom and only seeing sharks when they are right in front of you. Due to the brilliant visibility, you can see our sharks from deep down approaching from the depths and providing you with some amazing photo opportunities. It also makes for some amazing behavioral observations unlike anywhere else in the world. The water temperature at Guadalupe Island ranges from 65-75 degrees Fahrenheit. We suggest diving with a 5mm – 7mm wetsuit with a hood. Even though at times you may feel the cold, guests are rarely too concerned, as a 15ft shark looking at you soon takes your mind of it! Additionally, when you get out the water the blazing sun will soon get you toasty very quickly. Guadalupe Island lies in the middle of the Pacific approx. 220 miles southwest of San Diego and 165 miles west of Ensenada. From Ensenada it takes us 22-24 hours to get there. It is a remote and untouched location that when coming into view after such a long journey is an incredible spectacle for our guests onboard. What other marine life can I see during the trip? Great white sharks are not the only form of marine life you can encounter during our trips. Even on the travel days back and forth from the island we often come across what most people consider “once in a lifetime sightings” of the Pacific coasts wildlife. From dolphins riding the bow wave of our vessel, humpback, pilot, grey and blue whales commonly seen plus an abundance of seabirds, the journey to the island is a marine tour in itself! In past seasons we have come across mako, blue and hammerhead sharks as well as manta rays. Once at the island many species again, can be encountered, from the 3 species of seal found along its coastline to dolphins, turtles, schools of tuna and the islands’ rare beaked whales. Sleeping quarter’s onboard the vessel are stateroom style with 2 beds per room. Each room is air-conditioned with a sink, mirror, electrical outlets and plenty of storage space. Berths have pillows, full linens including a fitted sheet, top sheet and comforter. You have the option of sharing or can have a private room all to yourself. What is the food like and can you cater for specific diets? Our food is freshly made and lovingly served by our friendly Chefs. As well as cooking 3 full and varied meals a day, they provide you with all the snacks you can eat including freshly caught sushi. The bar or kitchen is always open for you to help yourself to any food that is available! Depending on your diet we are very flexible and will cater for whatever your requirements are including vegetarian options. Put simply, the food on this trip is as memorable as everything else and you will not go hungry. What experience does your operation have? Experience is our number one contribution to this trip. The crew have been diving and sailing Baja and Southern Californian waters for over 25 years and their knowledge of the area is impeccable. Our team consists of highly experienced captains and crew all federally licensed mariners. Even our chef has the qualifications required! We believe our team is the most qualified and well-rounded operations at Guadalupe Island. Tell me about your safety record? Our trip boasts a 100% safety record that we are very proud of and wish to maintain. How is this possible? Well, we are aware that working with such a large animal in its own environment requires no room for error and have implemented strict and safe procedures to achieve this. This requires the correct deployment of equipment, personnel, and experience. When accidents happen in this industry it is usually due to operator error, something that we have never been involved in. Any kind of accident is not only bad for our customer, but also the sharks and the shark diving industry as a whole. What makes you so successful at getting sharks? Although we have a 100% success rate, this is not what makes us unique. What does, however, is that our crew are so in touch with the environment and its varying conditions we are able to consistently find more sharks than any other operator at Guadalupe Island. Our crew are also highly experienced fishermen and finding fish is their specialty. A great white shark is just a large fish and because of this our superb team are capable of not just showing you one, but up to 10 different sharks a day. The team use their years of experience of the water and the animals and their commitment to giving you the ultimate experience is what stands us apart from many other operators. What are the cages like? The cages are a huge talking point when customers first board our vessel and we are proud to show them off, as we believe they are amongst the finest in the industry. Our cages were created under the direct supervision of experienced marine welders in San Diego. The superior quality of materials used make them the finest and largest cages in the waters of Guadalupe Island. Another plus is that they were designed with the diver in mind for easy access both in and out of the water, offering plenty of space for up to 4 divers, plus great viewing windows for fantastic photographic opportunities. Are we breathing off SCUBA? Yes, we use a hookah system that is very simple and easy to use. We are all divers in our team and we know what makes the correct air system. When spending so much time underwater viewing sharks you want to be comfortable. We have spent years diving locations around the world and unfortunately, have had many uncomfortable experiences with operator’s equipment. It can ruin the entire trip so we want to get it right. Twin Bauer compressors fill our massive air banks on a nightly basis and supply correctly filtered air throughout the dive day. Additionally our regulators and dive equipment are serviced to the highest standards. I’m a photographer / Film crew looking for particular shots is this possible? Professional photographers and film producers frequently use us. The reason? Superb knowledge of our environment. Many of our crew are themselves enthusiastic photographers and are only too keen to pass on tips and advice on how to get that “specific shot”. Our lead shark guide brings a wealth of knowledge and expertise to the team and his passion and commitment is invaluable to enabling you to achieve your shots whilst interacting with the sharks. The additional option of the submersible cage also enables photographers to capture different angles and unusual perspectives. Alternatively, for film production we offer two extra filming cages that have been used successfully in many documentaries. Get in touch to find out more. Is the boat and crew certified by any reputable agency? Our vessel is a United States Coast Guard inspected vessel. We comply with all safety requirements and maintain our vessel to strict federal standards. Our captains (at least 3 on every trip) all maintain proper licenses and our entire crew is STCW (Standards of Training, Certification and Watch keeping for Seafarers) certified and part of a USCG mandated random drug testing consortium. As a U.S. flagged vessel, we benefit from the United States Coast Guard’s network of safeguards including, but not limited to, emergency airlifts at sea. In an emergency situation these assets are only one call away us one of the safest operations at Guadalupe Island. Are the sharks respected and treated in the correct manner? This is a topic that we feel very strongly about. When joining our operation you will see evidence of total respect for these graceful and beautiful animals. Under no circumstances are they, injured, harassed or made to perform for customer satisfaction. This is unethical and we believe that the great white shark is impressive enough without being made to behave unnaturally, thereby putting both the divers and the sharks at risk. We have unfortunately witnessed other operators making the sharks “entertain” customers and Shark Diving Xperts are completely against this practice. What TV shows have I seen you on? Since we have begun operating at Guadalupe Island we have been involved with a number of different TV shows. In 2012 we were used for logistics on the documentaries “Spawn of Jaws” and “Sharks of the Mediterranean”. In 2014 we collaborated with the BBC for the White shark segment of the series “Shark” and from 2015 to 2018 we have been featured heavily on Discovery Channels’ shark week featured in documentaries such as “Island of the mega shark,” the “Air Jaws” franchise, the “GW serial Killer” franchise and the acclaimed “Great White Abyss”. Where do we depart and arrive from? We pick all our guests up from Fishermans landing in Point Loma, San Diego at 6am. After a welcoming we make our way down to Ensenada by coach, crossing the boarder of Mexico and arriving at the boat in Ensenada at 8.30am. Guests do not have to do anything during this process, our crew take care of all the paperwork and soon after we depart Ensenada and begin to make our way to Guadalupe. This journey takes us around 22-24 hours so we travel over night and arrive at the island the following morning. Along the way, guests are served fantastic food, can relax, watch movies and keep an eye out for dolphins, whales and many other species of wildlife. Once at the island we begin diving. We dive from around 7am – 4pm each day and then on the last day we begin our journey back. We arrive back in Ensenada between 9-10 am and board the coach back to Fishermans Landing in Point Loma in San Diego between 1-2pm. What do you recommend bringing? Completed booking paperwork, trip insurance, your own dive mask (if you have one), underwater camera, certification cards (if you have them), cap and woolly hat, sunglasses, jacket, sandals, hooded sweatshirt, sunscreen, towel, binoculars, toiletries, Books, batteries/chargers and don’t forget your passport! Where can I stay the night before and after boarding? If you are visiting San Diego for the first time we recommend staying at least one night either side of the shark adventure with us. The first morning pick up point is from Fisherman’s Landing in Point Loma, San Diego and there are many places to stay the area. We recommend the Holiday Inn, Point Loma as it does lifts to and from the airport (which is only 5 mins away) as well as shuttles from the hotel to the landing (which is only 2 mins away). Over the past few years we have set up a good partnership with the Holiday Inn and many of our guests will stay there. Alternatively, there are many other hotels/motels in and around the area not far from our pick up point. Do you commit to great white shark conservation and research? Shark Diving Xperts believe strongly in supporting shark conservation and research not just for great white sharks but all sharks worldwide. For the past 6 years, we have been leaders in scientific study and conservation efforts at Guadalupe Island. Many scientific findings originating from Guadalupe Island are as a direct result of our on-site logistical and financial support. We work closely with graduate students from CICIMAR as well as the island’s leading scientists and will continue our support into the future. For further information please see our shark research page. Where and when is the first morning pick up point? Our meeting point is Fishermans Landing in Point Loma, San Diego (a location 10 mins from San Diego Airport) near many places to stay in the area. We will greet all guests at 6am and board our coach to Ensenada. Light snacks and drinks will be served during the journey across the boarder to Mexico. On return, after departing the boat in Ensenada, we will travel by coach back to San Diego and drop all guests back off at Fishermans Landing in Point Loma between 1-2pm. When is the best time of year to see sharks? The sharks arrive at Guadalupe from late July till late December so we schedule our trips for right in the middle of the season so as to be there at the best time. We have never not had sharks on any day of any of our trips, however, there are slight variations to what you can see depending on when you come. In September we get fantastic hot weather and really good numbers of sharks (mostly males). As we go into mid to late October the weather cools and the numbers go down slightly. However, this is typically the time when the huge females turn up and it is not uncommon to see at least one or more 15-18 ft. sharks during trips at this time of the year. Spectacular!